Buckingham Palace is one of London’s most popular attractions, attracting over 15 million tourists each year. As the Queen’s official London residence, the palace relies on a large team of dedicated staff to provide advice and support to the Queen and keep things running smoothly. There are currently over 800 people working at Buckingham Palace, with roles as varied as retail, IT, media relations, gardening, housekeeping and, of course, catering. With over 50,000 people attending garden parties, investitures, lunches and banquets at the palace each year, those members of staff who work in the royal kitchens play a critical role in the running of the royal residence. Buckingham Palace’s royal kitchens are run by a team of around 20 chefs, who work alongside a team of support staff. To work in the kitchens, chefs need to have experience of fine dining, a catering qualification, plus knowledge of classic cuisine and ‘kitchen French’. As a member of the Royal Household, staff members are also expected to demonstrate high standards and an exceptional level of professionalism. In return, kitchen staff are given opportunities for personal and professional development, and, due to the nature of the job, are well placed to benefit from the palace’s tendency to promote internally. Furthermore, as well as serving the Queen at Buckingham Palace, many staff members also get the opportunity to work at other royal kitchens such as the Palace of Holyroodhouse and Balmoral. Working in the palace kitchens is very different from working in a hotel or restaurant. As well as catering for the Royal Family, the kitchens also provide staff meals and cater for official events such as state banquets and garden parties. One day you might be preparing supper for the immediate Royal Family, the next you could be serving a sit-down meal for up to 600 people. With this in mind, the work is very busy and extremely varied. Menus are changed every week which means that the staff are regularly learning new dishes. It is also the little details that make all the difference, such as knowing how Prince Harry likes his steak cooked or remembering the Queen’s favourite ice cream flavour. While the day to day running of the royal kitchen offers plenty of challenges, it is at the state banquets that the kitchen staff really prove their worth. State banquets, of which the Queen has held 110 during her reign, require at least ten days of intensive preparation to ensure everything is ‘just so’. 1700 pieces of cutlery are laid out with careful precision on the 175-foot dining table, and the 170 guests are served on crockery from King George IV’s Grand Service. In the kitchen, preparations start months before with special menus needing to be designed and approved. As part of the menus, royal chefs usually include an element that relates to the guest nation – for example, chefs made sugar orchids for the President of Singapore to represent his country’s national flower. Chefs have also been known to make spun sugar versions of the Union Jack and the flag of the visiting country. On the night of the banquet, kitchen and waiting staff work to a hidden traffic light system, waiting for the amber light which tells them they can serve the next course. At the end of the event, the priceless crockery is taken downstairs to be washed by hand – not a job for the faint hearted or clumsy! Working in the royal kitchens of course means that you are privy to the eating habits and foibles of the royal family. While the palace has remained tight lipped about specifics, previous employees have spilled the beans about providing special menus for the corgis, preparing carrots of equal length for the horses, and ensuring that the Queen is only ever served sandwiches that are round or octagonal in shape – apparently rectangular sandwiches resemble a coffin which can be construed as wishing the Queen ill! As a nation with a huge interest in the lives of the monarchy, looking at the royal kitchens provides us with a great insight into what happens at Buckingham Palace. It’s clear to see that the kitchen is a key cog in the palace machine and plays an indispensable part in both the Queen’s personal and public life. William Durrant is the managing director of Herringbone Kitchens, a Canterbury based kitchen designer and installer. 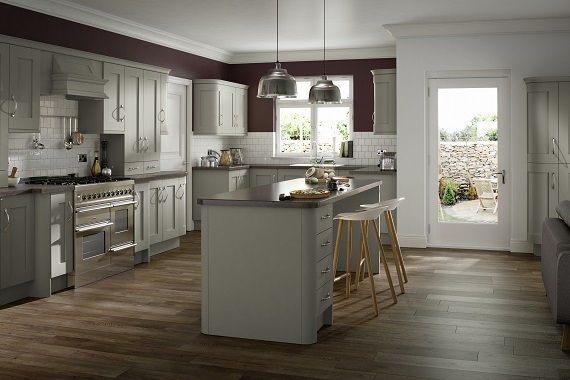 For kitchen inspiration visit one of their kitchen showrooms in Kent.